A central concern in 1st century Judaism was the covenant with God, and the status of the Jews as the chosen people. Many Jews believed that this covenant would be renewed with the coming of the Messiah. The Law was given by God to guide them in their worship of the Lord and in their interctions with each other, "the greatest gift God had given his people." The New Testament's Acts of the Apostles and Epistle to the Galatians record the existence of a Christian community centered on Jerusalem, and that its leaders included Peter, James, the "brother of Jesus", and John the Apostle. [note 5] Legitimised by Jesus' appearance, Peter was the first leader of the Jerusalem ekklēsia. He was soon eclipsed in this leadership by James the Just, "the Brother of the Lord," which may explain why the early texts contain scarce information about Peter. According to Lüdemann, in the discussions about the strictness of adherence to the Jewish Law, the more conservative faction of James the Just took the overhand over the more liberal position of Peter, who soon lost influence. 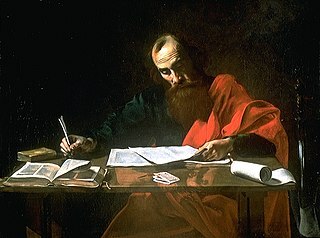 The Jerusalem Church "held a central place among all the churches," as witnessed by Paul's writings. ^ For a review of the most recent editions of the Apostolic Fathers and an overview of the current state of scholarship, see Timothy B. Sailors, "Bryn Mawr Classical Review: Review of The Apostolic Fathers: Greek Texts and English Translations". Retrieved 2013-01-25. Christology, literally "the understanding of Christ," is the study of the nature (person) and work of Jesus Christ. It studies Jesus Christ's humanity and divinity, and the relation between these two aspects; and the role he plays in salvation. 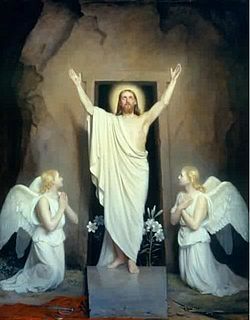 The resurrection of Jesus is the Christian belief that God raised Jesus from the dead after his crucifixion. In Christian theology, the death and resurrection of Jesus are the most important events, and a foundation of the Christian faith. 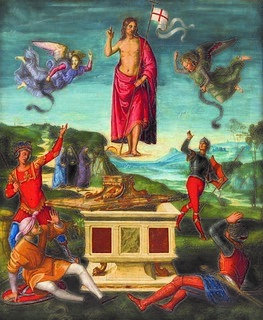 While for Christians the resurrection is taken to have been a concrete, material resurrection, the appearances of Jesus are often explained as visionary experiences, in which the presence of Jesus was felt, and which gave the impetus to the exaltation of Jesus and the resumation of the missionary activity of Jesus' followers. Ebionites is a patristic term referring to a Jewish Christian movement that existed during the early centuries of the Christian Era. 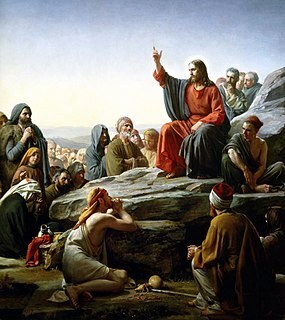 They regarded Jesus of Nazareth as the Messiah while rejecting his divinity and his virgin birth and insisted on the necessity of following Jewish law and rites. 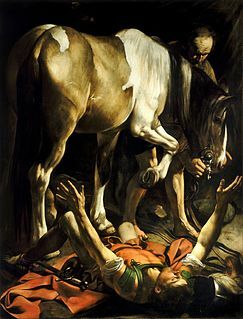 They used only one of the Jewish–Christian gospels, the Hebrew Book of Matthew starting at chapter three; revered James, the brother of Jesus ; and rejected Paul the Apostle as an apostate from the Law. Their name suggests that they placed a special value on voluntary poverty. Ebionim was one of the terms used by the sect at Qumran who sought to separate themselves from the corruption of the Temple. Many believe that the Qumran sectarians were Essenes. Most scholars who study the historical Jesus and early Christianity believe that the canonical gospels and life of Jesus must be viewed within his historical and cultural context, rather than purely in terms of Christian orthodoxy. 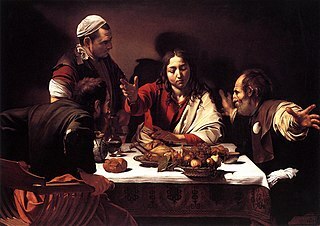 They look at Second Temple Judaism, the tensions, trends, and changes in the region under the influence of Hellenism and the Roman occupation, and the Jewish factions of the time, seeing Jesus as a Jew in this environment; and the written New Testament as arising from a period of oral gospel traditions after his death. The Christ myth theory is the view that "the story of Jesus is a piece of mythology", possessing no "substantial claims to historical fact". Alternatively, in terms given by Bart Ehrman paraphrasing Earl Doherty, "the historical Jesus did not exist. Or if he did, he had virtually nothing to do with the founding of Christianity." The term proto-orthodox Christianity or proto-orthodoxy was coined by New Testament scholar Bart D. Ehrman and describes the Early Christian movement which was the precursor of Christian orthodoxy. Ehrman argues that this group from the moment it became prominent by the end of the third century, "stifled its opposition, it claimed that its views had always been the majority position and that its rivals were, and always had been, 'heretics', who willfully 'chose' to reject the 'true belief'." In contrast, Larry W. Hurtado argues that proto-orthodox Christianity is rooted in first century Christianity. Traditionally in Christianity, orthodoxy and heresy have been viewed in relation to the "orthodoxy" as an authentic lineage of tradition. Other forms of Christianity were viewed as deviant streams of thought and therefore "heterodox", or heretical. This view was challenged by the publication of Walter Bauer's Rechtgläubigkeit und Ketzerei im ältesten Christentum in 1934. Bauer endeavored to rethink Early Christianity historically, independent from the views of the current church. He stated that the 2nd-century church was very diverse and included many "heretical" groups that had an equal claim to apostolic tradition. 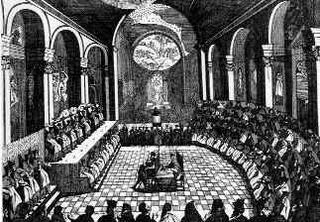 Bauer interpreted the struggle between the orthodox and heterodox to be the "mainstream" Church of Rome struggling to attain dominance. He presented Edessa and Egypt as places where the "orthodoxy" of Rome had little influence during the 2nd century. As he saw it, the theological thought of the "Orient" at the time would later be labeled "heresy". The response by modern scholars has been mixed. Some scholars clearly support Bauer's conclusions and others express concerns about his "attacking [of] orthodox sources with inquisitional zeal and exploiting to a nearly absurd extent the argument from silence." However, modern scholars have critiqued and updated Bauer's model.